Excerpts from an interview with Ken Hensley published in the “InRock” magazine (№ 8, 2002, category “The Person”). InRock: Do you remember the first song you’ve ever recorded or composed? Ken Hensley: Actually I thought I did, but then somebody came up with the tape the other day that I did in 1966 or something I didn’t even know I’d done. Or maybe earlier, like ’64, maybe with one of the groups I was in when I was in school or just after school. I don’t remember too much about that time. IR: In my opinion, your musical composing style is pretty much close to the style of The Beatles, because the basis for it is a melody. What is your attitude to The Beatles? KH: I think they were the first people to put meaningful lyrics into rock songs, or pop songs actually, so Lennon-McCartney were very inspirational to me, at the time when I was trying to turn my poetry into music, and so I really, really listened to what they did. And I always believed that a good song is a simple song that consists of just a good, solid, simple melody with straightforward lyrics. So I tried to make my songs about many different things, and I tried to make them easy to understand. There’s nothing too complicated about them. IR: By the way, what for you goes first — the lyrics or the music? KH: Always the lyrics. In the ’70s I had to learn to write songs while I was flying and travelling, because we were doing an album every nine months. So I had to come up with a lot of songs. I would write lyrics while I was in a car, or while I was on a plane… And just at soundchecks I’d start to turn them into songs. That’s how it went. I actually believed that words have rhythm and they also have melody, and I think it’s easy (for me at least) to find the tune to go with the words once the words are written. The other way round I have a real problem doing that. IR: Can you shed more light on the situation with The Gods, Head Machine and Weed? Who was the author of most of the songs? KH: With The Gods we did a lot of other people’s music but we also did a lot of our own songs. Joe Konas and I used to write most of the material. Weed and Head Machine were contract projects — they were just projects that somebody paid me to write some songs. In both cases the producers came to me and said, “Would you write some songs? I’ll buy these songs from you. I wanna use them for this specific project”. And so that’s what I did — sat down and, you know, scratch down. IR: But you also played and sang there. KH: Yeah, in the end I was asked to play on them, too, that’s true, which is fine. In those days I really needed money, so it was a very helpful way of making a little bit of money. IR: Yes, you once said that the only reason for those records was money. But they don’t sound like so-called ‘commercial’ ones, there’s a lot of soul and feeling about them. How could you explain that? 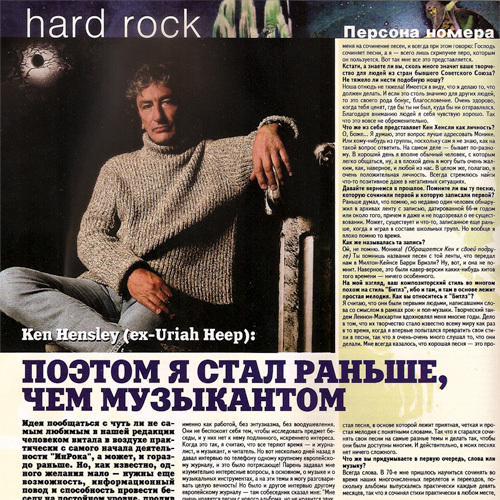 KH: Well it was just because I was still learning how to write songs in those days so I think what was happening I was always experimenting with those songs, in the same way I experimented with the early songs in Uriah Heep. I mean we were experimenting really though our first three albums. It wasn’t till the end of the “Look At Yourself” sessions when we began to really see our direction. So I was still learning how to write songs at that point. And I learned English in school, and I always loved playing with the language, that’s why I started writing poetry. And when poetry became songs the style stayed pretty much the same. IR: With word-play you mean “I’m beginning to think that a forever kind of love is the kind of love I’ll look for forever”. KH: True! And “today is only yesterday’s tomorrow”. It’s just an unusual way of saying simple things. IR: It sounds great — very poetic. KH: English is a great language, so it’s fun to play with it. I would never write songs about conversations I could always hear in a bar, I’m not interested in writing those kind of songs, or about violence, because, as I said, I started writing poetry, and poetry has to be very colourful, because it doesn’t have the benefit of music. To help paint the picture, the words have to be the sound as well, as they set the picture. I think it’s a good basis for the songs — the poetry. IR: Ken, let’s go back to your music and your early projects. Who were other participants of Weed and Head Machine? IR: I think you mean Head Machine. However, your other side project, Weed, was recorded in Germany? KH: Weed I did in Germany, in Hamburg, with a drummer, and I played just about everything else — piano, guitar, organ and stuff. Drummer and bass player I used. I did most of the vocals myself. On the Head Machine project we used Lee, and John Glascock played on a couple of things. I just don’t remember all of who the musicians were. It was a very quick one. Done in a week. IR: However, the music is just great. And by the way, do you remember you promised us to re-listen to them? Did you? KH: Actually, no. But I will do that. I mean the problem is to me that they were contract projects, so once I finished they were gone. I had no recollection until suddenly I started to see them for sale in the Uriah Heep Appreciation Society magazine, and I thought, where did people dig those up from? I thought they were dead and buried and gone. But they were resurrected. IR: No, they did not die, and there are some great tunes on them. KH: Thanks. I must listen to them again. The full version of the interview was published in the “InRock” magazine (№ 8, 2002, category “The Person”).